Skype messenger is one of the popular messenger now a day that provides chat and call on desktop and mobiles. Most of us frequently do chatting,calling through Skype. Sometimes we do mistake by sending messages to un-intended receipients and later we realise that ohh.. it's gone to some other person. 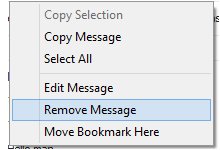 Skype provide facility to recall/delete messages in skype if it is unread or undelivered. We can also edit the messages if required. Click on Remove to delete this message. Edit the message and click send to complete the changes.